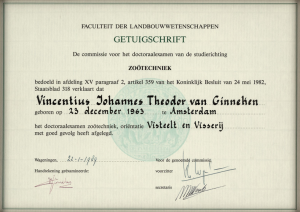 WO Agricultural Sciences at Wageningen University, Animal Husbandry; MSc Aquaculture, degree obtained in 1989. 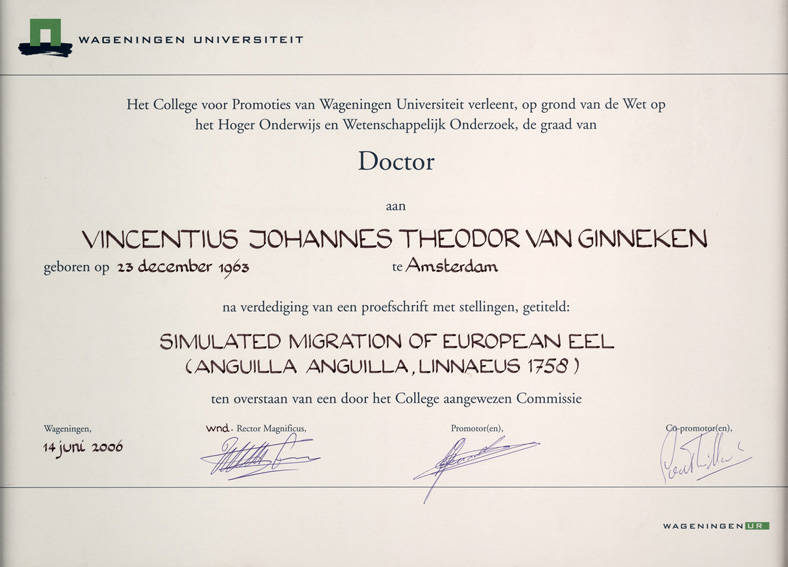 Wageningen University, Faculty of Agricultural Sciences, thesis graduated in 2006: ”Life-cycle and reproduction of the European eel (Anguilla anguilla)”. University of Leiden, Faculty of Mathematics and Natural Sciences, thesis graduated in 1996: “The effects of adverse environmental factors like hypoxia and acidification on the energy metabolism of fish: an in vivo 31P-NMR and calorimetric study.”. Schouten en Nelissen, Management training, certification achieved in 2010. Sabbatical: work on the book “The Global Ten Billion People Issue” core issue: global health world population directly correlated to the food quantity targeted at ≈2800 kcal/caput/day. At present A.D. 2013 with a global world population of ≈ 7 billion people, around 1 billion are dying a hungry death (BMI<15) while on the other side 1 billion people are dying a hungry death (BMI < 30) over a more extended period of 20 years due to the consequences of obesity (BMI> 30) and its “burden” of economic very costly Chronic Degenerative welfare diseases (CDs). Department of Aquaculture and Fisheries (AFI),Department of Aquaculture & Fisheries, Wageningen University, The Netherlands. Associate Professor (UHD). Practical work for publ. 8 (sleep in fish). Scientific Book in preparation. Work out part III). the substitute Paleolithic diet based on the sustainable ecological balanced new agricultural process a sea-based “Integrated MultiTrophic Aquaculture” (IMTA) approach of food ingredients based on seaweeds, bivalves and (cheap≈herbivorous) finfish. Seaweed work partly based on work performed at PRI (WUR) period: 2008-aug.2010. Research: The development of the sea farm (with emphasis on seaweeds. Note: the food components of the sea farm have great correspondence with these of the “Paleolithic diet” [hunter-gatherer diet] (see publication no.62) for which it is assumed they prevent chronic degenerative Westernized inflammatory diseases like Insulin Resistance (IR) and/or Type-2 Diabetes. Research: “Is swimming the natural trigger for eel maturation?” Integrative Zoology, Biology, University Leiden. Here I have performed MRI studies on the effects of anti-HIV cocktails on the fat distribution in mice models. The research I have performed during this period was focused inducing by High Fat diet intervention Insulin Resistance (IR)/type-2 Diabetes (DM2) in a C57BL/6 mouse model. With LCMS techniques of heart-, hindlimb-, non-adipose muscle, liver, brain and blood plasma the different lipid fractions were determined in order to find possible biomarkers and unravel the organ/tissue dependent causes for DM2. There was also focus on hepatic steatosis and fatty degeneration of heart muscle caused by a high-fat diet. For this purpose a special MRI technology application was developed which was validated with a conventional technique like thin-layer chromatography (HPTLC). Finally we could apply localized in vivo MRI in combination with 1H-NMR on a voxel of mouse liver tissue to study the process of hepatic steatosis. EC-project: “Quality of Life and management of Living Resources”, “Estimation of the reproduction capacity of European eel”. PCB experiments on the migration of eels in large swim tunnels of two meters. Sponsor EUROCHLOR. STW-project: ‘Simulated migration of European eel”. PhD-thesis-1: “Influence of hypoxia and acidification on the energy metabolism of fish: an in vivo 31P-NMR and calorimetric study”. Here I worked as part-time assistant for the Netherlands University Foundation For International Corporation (NUFFIC). 1988-1989: 1 year Brawija University, Malang, Indonesia. 1999: 2 months working in the physiology/endocrinology laboratory of Dr. Sylvie Dufour, Museum National Histoire Naturel (MNHN), Paris, France. 1). Construction elements for the fish hatchery not available in Malang. Purchasing of certain items such as PVC parts, PVC welding equipment, pumps, water quality control test kits. 2). Reproductive Endocrine techniques to get eggs and larvae of the spawners (“artificial reproduction technique” by administration of hormones (bought in the Netherlands), egg incubators, larvae rearing systems, and juvenile feeds specially supplemented with minerals and vitamins. 3). Nutrition, bomb-calorimetry techniques in order to measure the energy content of foodstuffs and tissues of fish, chemical analysis to determine the fat-, protein- and carbohydrate-, dry matter content of fish certain fish foods. A machine to make pelleted food which remains its texture longer in water while feeding the fish. 4). Fish disease laboratory with the possibility to make microscopic preparations of tissues/organs by cutting the fixated material in parrafin using a microtome. Other accessories: tissue fixation fluids, hydration, dehydration series, vacuum-pump, advanced microscope with photo camera, microscopic small tools like object- and cover-glasses, bath sets and associated chemical compounds, staining fluids for the microscopic preparations, hematological techniques, microbial techniques such as the API system to identify bacteria, antibiotics, dissection and cutting material for anatomical dissection of animals, anesthetics for the fish etcetera, etc. Writing Interim progress reports to the Ministry of Education and Wageningen- and Brawijaya-University. Responsibility for the financial budgeting and interim evaluation with the project leader in Indonesia and overall project manager at AFI (WUR) (note: the budget for purchasing materials out of the Netherlands was 1,000 kEuro over two years. Consultation with staff and Wageningen analysts, representatives of companies to buy the materials. Arranging transportation, consultations with customs clearance, consultation with the Dutch embassy in Jakarta for the clearance of the goods. Continuous consultation with the project leader in Indonesia. Tuning of the internship period of Wageningen students with their Indonesian counterparts and the visit of a Dutch staff member to give a practical course and teaching. Overall a real management position with the responsibility over a budget of 1,000 kEuro. February 1992: BION-meeting Leiden.’ Investigation of hypoxia with non-invasive techniques: calori­me­try and 31P-NMR’. February 1993: Animal Physiology-meeting Utrecht. ‘Dynamic analysis of the energy metabolism in white muscle of fish during hypoxia and recovery: an in vivo 31P-NMR study’. February 1993: NMR-meeting, Leiden. ‘Fish muscle energy metabo­lism during hypoxia and recovery: an in vivo 31P-NMR study’. April 1994: Society for Experimental Biology, Swansea (UK). ‘Hypoxia induced metabolic changes in fish; a in vivo 31P-NMR study’. December 1994: Staffcolloquium Biology Leiden, ” Survival strategies of fish to adverse environmental factors“. April 1995: “4th International Conference on Calorimetric studies of the chemical stability of solids, liquids and mixtures”, Univer­sity of Kent (UK). ‘Direct and indirect calorime­try of fishes exposed to unfavoura­ble environ­mental conditions: hypoxia and anoxia’. June 1995: AIO/OIO-meeting institute BIOMAC, structure and function ­of Biomacromolecules, Oestgeest. ’ in-vivo 31P-NMR spectrosco­py on fish, monitoring of environmental effects’. September 1996: Symposium in vivo NMR-Present and future, Utrecht University,‘Influence of hypoxia on the energy metabolism of white and red muscle of Tulip. An in vivo 31P-NMR and respirometric study’. October 1996: Symposium on on-and offline techniques in animal and plant cell culture, Utrecht, ‘In vivo 31P-NMR: a sensitive monitoring system to study the influence of envi­ronmental stressors such as hypoxia and acidification on the energy metabolism’. October 1997: Staffcolloquium Biology Leiden, ” Eelmigration”. June 2000, Fish culture and Fisheries, Wageningen University: ‘Sophisticated research tools for Aquaculture and Fisheries’. September 2000: Faro, Portugal, European Congress of Comparative Endocrinology.‘Spawning behaviour of eels’ (including video presentation). September 2000: Neuroecology, Utrecht University: ‘Sophisticated research tools for Aquaculture and Fisheries’ (including video presentation ‘spawning eels’). November 2000: Organisation of Improvement of Inland Fisheries (OVB, Nieuwegein). ‘The European eel: its lifecycle and reproduction’. November 2000, Fish culture and Fisheries, Wageningen University: ‘The European eel: its lifecycle and reproduction’ (including video presentation ‘spawning eels’). November 2000: “Lionsclub Wageningen”: ‘The European eel: its lifecycle and reproduction’ (including video presentation ‘spawning eels’). January 2001: ‘Ministry of Agriculture and Nature conservation (LNV)’: ‘The European eel: its lifecycle and reproduction’ (including video presentation ‘spawning eels’). March 2001: Animal Physiology, Nijmegen University: ‘The European eel: its lifecycle and reproduction’ (including video presentation ‘spawning eels’). May 2001, Student-Society “Aquarius”, Wageningen University: ‘The European eel: its lifecycle and reproduction’ (including video presentation ‘spawning eels’). October 2001, ‘National Institute for Fisheries research (RIVO, IJmuiden)’. ‘The European eel: its lifecycle and reproduction’ (including video presentation ‘spawning eels’). November 2001, WIAS-Seminar, ‘Studies on Stress and Metabolic Adaptation, Human and Animal Physiology, Wageningen University: ” Up-regulation (swimming activity) and down-regulation (metabolic depression) of the energy metabolism of eels during their life cycle”. November 2001, Benelux-congress Nijmegen University, ‘Why do fish die after severe exercise?’ A question revisited using in vivo 31P-NMR’. May 2002, Animal Physiology Nijmegen University, ‘Effect of 6000 km migration on energy metabolism and endocrinology of European eel’. November 2002, First annual meeting EU-project, EELREP, at CEMAGREF, Bordeaux, Cedex, France, ‘The reproduction cycle of the European eel: Silvering characteristics of males of the farm and females from lake-Grevelingen, the Netherlands’. March 2003, IZ-and IMP meeting Biology, Leiden University, ‘Gynogenesis with the Zebrafish, a promising research tool for Developmental Biology’. September 2003, The International Society for Biological Calorimetry (ISBC), XIIIth Conference Würzburg, Germany. Metabolic depression in the European eel and the goldfish: a radiotelemetric and calorimetric study. November 2003, 10th Benelux Congress of Zoology, Leiden University, The Netherlands, Metabolic depression in the European eel and the goldfish: a radiotelemetric and calorimetric study. November 2003, Annual meeting second year EELREP, Leuven, Belgium. Possible causes for decline of the eel population. 19-22 July 2004, Annual meeting third year EELREP, Brest, France. Possible causes for decline of the eel population, an overview. 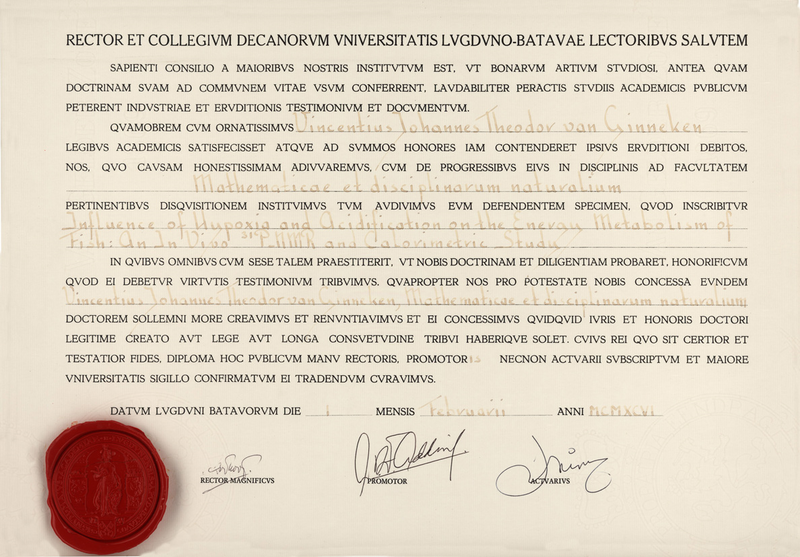 1 February 2005, This week discoveries, Leiden University b-faculty. Liver fattening during famine and feast, an evolutionary paradox. A localized MRI-spectroscopy study. 28 March-1 April 2005, Fish and Diadromy in Europe, Ecology Management, Conservation, Bordeaux. Possible causes for decline of the eel population. 28 October 2005, 12th Benelux Congress of Zoology, Lecture: Liver fattening during famine and feast, an evolutionary paradox. A localised MRI-spectroscopy study. 18 September 2006, “Sophisticated research tools for aquaculture”, Hirthals, DIFRES, Denmark. 5 October 2006, “Simulated migration of European eel”, In the Spotlight, Biology Seminars, Institute Biology Leiden (IBL). 10 September 2007, Medical Systems Biology: Biomarkers for liver fattening (hepatic steatosis), cardiovascular diseases and obesity. Institute Biology Leiden (IBL). 1 & 2 November 2007, 14th Benelux Congress of Zoology, Amsterdam, Oral presentation: Medical Systems Biology: Biomarkers for liver fattening (hepatic steatosis), cardiovascular diseases and obesity. 1-3 September 2009, ESMC Congress 1-3 September 2009, Concerneaux, France, Cell suspension of Ulva lactuca to feed shellfish. V.van Ginneken (oral speaker), J.Wald, W.Brandenburg. 1-2 December 2010, 4th International Algae Congress, Amsterdam, The Netherlands, Seaweeds for proteins, W.Brandenburg (oral speaker), V.van Ginneken, J.Wald. 1-2 December 2010, 4th International Algae Congress, Amsterdam, The Netherlands, Seaweeds as crop plants, W.Brandenburg (oral speaker), V.van Ginneken, J.Wald. 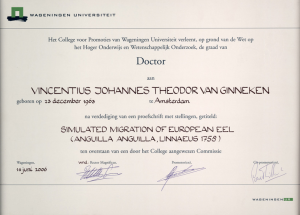 4 October 1998, National Science day, museum Naturalis, Leiden, The Netherlands, poster presentation: Vincent van Ginneken and Guido van den Thillart: ‘Eel migration –6000 km migration in a swim tunnel, simulation leads to maturation’. 6,7,8 October 1998, 36e congres, ‘Biotechnische dagen’, Lunteren. Posterpresentation: ‘Palingmigratie –6000 km in een zwemtunnel, simulatie van de trek leidt tot geslachtsrijping’. 30-31 oktober 1998, Informative days, Leiden University, Pieterskerk, swim tunnel demo and poster presentation. 20-24 September 1999: Silkeborg Denemarken, 2 poster presentations by Vincent van Ginneken and Guido van den Thillart. ‘Seasonal changes of endocrine and metabolic parameters of European yellow and silver eel’ ‘Fat stores of European silver eel are sufficient for spawning migration’. Poster presentation: Proceedings of Measuring Behavior 2000, 3nd International Conference on Methods and Techniques in Behavioral Research, p: 113-114 (2000). Cardiovascular measurements of small fish by radio-telemetry: A preliminary study. V. van Ginneken, P. Snelderwaard, H.-P. Voss, R. van der Linden, D. van der Reijden, A. ; Gluvers, G. van den Thillart and Klaas Kramer. Poster presentatie 5-9 september Faro, Portugal, European Congres of Comparative Endocrinology. ‘Seasonal changes of endocrine and metabolic parameters of European yellow and silver eel‘. V.van Ginneken and G.van den Thillart. Video presentation: “Spawning behavior of the European eel”, 5-9 september Faro, Portugal, European Congres of Comparative Endocrinology. ‘V.van Ginneken, G.Vianen, G.van den Thillart, Bie Muusze. Poster presentation: NMR-DG symposium, Nijmegen University, 1 december 2000.‘Why do fish die after severe exercise ?’ A question revisited using in vivo 31P-NMR.Vincent van Ginneken, Thomas Sundermeier, Ron Boot, Karen Coldenhoff, Johan Hollander, Fons Lefeber, and Guido van den Thillart. Poster presentation: 7th Benelux Congress of Zoology. 24-25 november 2000 Brussel. Vincent van Ginneken and Guido van den Thillart. ‘Fat stores of European silver eel are sufficient for spawning migration’. (2000). Surgical procedures for implanting a radio-telemetry transmitter to monitor ECG, heart rate and body temperature in small Goldfishes and Gold carps under laboratory conditions. P.Ch. Snelderwaard, V. van Ginneken, F. Witte, H.-P. Voss, and K. Kramer. Poster presentation: American Association for Laboratory Animal Science (AALAS), 51th National Meeting, San Diego, California, USA (2000). Surgical procedures for implanting a radio-telemetry transmitter to monitor ECG, heart rate and body temperature in small Goldfishes and Gold carps under laboratory conditions. P.Ch. Snelderwaard, V. van Ginneken, F. Witte, H.-P. Voss, and K. Kramer. 16 March: Poster presentations: 6e National Telemetry Day, 16 March 2001, University Utrecht, The Netherlands: a). Cardiovascular measurements of small fish by radio-telemetry: A preliminary study. V. van Ginneken, P. Snelderwaard, H.-P. Voss, R. van der Linden, D. van der Reijden, A. ; Gluvers, G. van den Thillart and Klaas Kramer. b). Surgical procedures for implanting a radio-telemetry transmitter to monitor ECG, heart rate and body temperature in small Goldfishes and Gold carps under laboratory conditions. P.Ch. Snelderwaard, V. van Ginneken, F. Witte, H.-P. Voss, and K. Kramer. 6-11 May 2001, Poster presentation: 16th International symposium on biotelemetry, Vienna, Austria, Surgical procedures for implanting a radio-telemetry transmitter to monitor ECG, heart rate and body temperature in small Goldfishes and Gold carps under laboratory conditions. P.Ch. Snelderwaard, V. van Ginneken, F. Witte, H.-P. Voss, and K. Kramer. 24-28 August 2002, Poster presentation: Am.J.Phys.Soc.Int.Meeting, San Diego, California, USA. Simulation of the 6000-km migration of the European eel shows remarkable low energy costs. 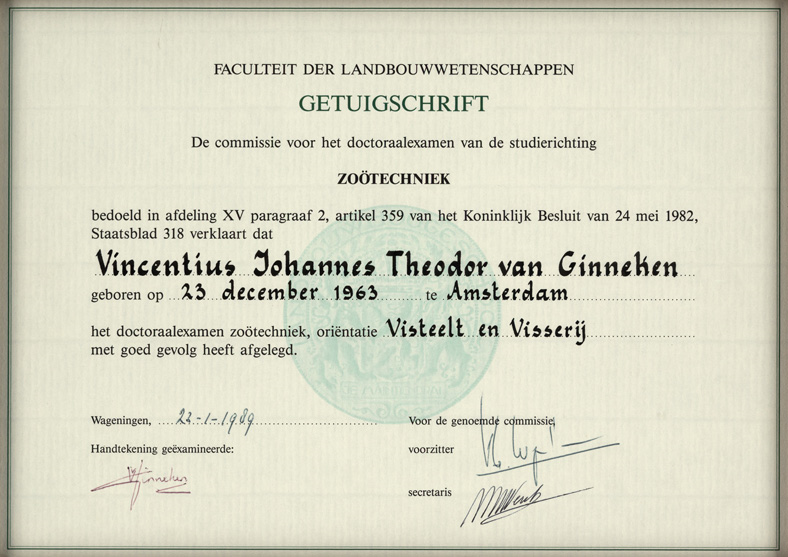 V.v.Ginneken, E. Antonissen, G.van den Thillart. 6-12 May 2006, Poster presentation: ISMRM 14th Scientific Meeting & Exhibition, Washington State Convention & Trade Center, Seattle, Washington, USA. Fat storage in the liver during feast or famine. V.J.T. van Ginneken, S.R. Kiihne, L. Ham, E. Verheij, R.E. Poelman, L. van der Weerd. Palstra, A.P., van Ginneken, V. van den Thillart, G.(2004). Artificial reproduction of the European silver eel (Anguilla anguilla L.). EAS Special Publication No 34. Palstra, A.P., Cohen, E., Niemantsverdriet, P., van Ginneken, V., van den Thillart, G.E.E.J.M.(2004). Artificial maturation and reproduction of the European silver eel: Development of oocytes during final maturation. International 5th Symposium on Fish Endocrinology, September 5-9, 2004. Castellon Spain. Palstra, A., Dufour, S., Thillart, G., Ginneken, V., 28 March-1 April 2005, Fish and Diadromy in Europe, Ecology Management, Conservation, Bordeaux. Natural and artificial induction of maturation of European eel. Thillart, G. van den, Palstra, A., Ginneken, V., Székely, C 28 March-1 April 2005, Fish and Diadromy in Europe, Ecology Management, Conservation, Bordeaux. Energetics of eel migration; swim fitness and swim capacity. G. van den Thillart, V. van Ginneken, A. Palstra, A.(2006). The 6000 km spawning migration of the European eel. VIIth International Congress on the Biology of Fish. St John’s, Newfoundland, Canada July 18-22. Palstra, A.P., van Ginneken, V.J.T., Murk, A.J., van den Thillart, G.E.E.J.M.(2006). Are dioxin-like contaminants responsible for the eel (Anguilla anguilla) drama? ICES Annual Science Conference CM 2006/J: 34. Palstra, A., van Ginneken, V., van den Thillart, G. (2007). Effect of swimming on silvering and maturation. European Aquaculture 2007, workshop on European eel reproduction. October 24, Istanbul (Turkey). van Ginneken, V., Bruijs, M., Murk, T., Palstra, A., van den Thillart, G. (2007). Simulated migration of European silver eel: effect on gonad development. European Aquaculture 2007, workshop on European eel reproduction. October 24, Istanbul (Turkey). 67 accepted or published publications in International Peer Reviewed Scientific Journals or book chapters or coauthor in chapters of “PhD-doctoral” theses. Prof.Dr.J. van der Greef, general Director TNO Pharma, Analytical Systems Biology, P.O.Box 360, 3700 AJ Zeist, The Netherlands. Also professor at the Division of Biopharmaceutics, Leiden-Amsterdam Centre for Drug Research (LACDR), Leiden University, Leiden, The Netherlands.